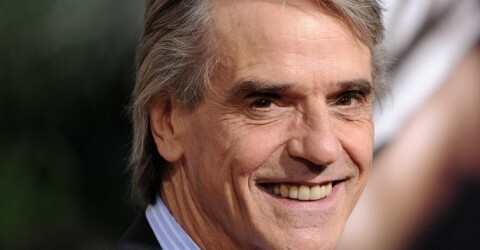 Q + LA – Jeremy Irons – LA Times Magazine – Read original article here. Of course Jeremy Irons makes his own cigarettes. He keeps in his pocket a two-sided leather pouch. One half holds the tobacco, the other those dark brown rolling papers favored by the Brits. He is unrepentant about what most everyone labels a vice. In March of 1987, despite her admonishments, he famously puffed away while sitting next to Princess Diana at a charity gala on the U.K.’s National No Smoking Day. He’s chimney-esque. It’s why we’re sitting outside, mid February in New York City, when the forecast calls for rain. But Irons has the most exquisite vocal cords, and perhaps tar and nicotine are the elements of his phonetical magic. To beat a dead horse here: Up close and in person, his pipes are almost unnerving, having an effect not unlike the enveloping THX surround-sound promo that’s played before movies start. Irons downplays his golden larynx with a proper Englishman’s manners, but everyone else has taken notice. He’s frequently called upon to narrate spoken-word recordings and documentaries, most recently The Last Lions from National Geographic, about the big cats in Botswana. (Familiar sonantal territory—who can forget his terrifying turn as Scar in The Lion King?) This month, that voice—and the body that houses it—stars in The Borgias, Showtime’s new drama series about a Spanish cardinal who ascended to the Papacy by decidedly Machiavellian means. Let’s hear it for the silver-tongued cads. What drew you to The Borgias? Neil Jordan, because he’s a director and writer I admire, and I was aware that a lot of the best writing and filming was happening on American television. [Also] the Borgias [1492–1503] is a very interesting period. How far from history does the show veer? Not that far. It’s difficult to get accurate historical information from that time, but there was a huge amount of wild stories about [Pope Alexander VI]. Are you anticipating flack from the Catholic Church? Obviously they’re nervous, but I hope it’ll be rather like if Queen Elizabeth went to see a production of Richard III. She wouldn’t say, “This is absolutely disgraceful.” She’d think it was historical, and I hope the Pope and the Vatican hierarchy take that attitude. It’s partly about how all power corrupts. That hasn’t changed. What age were you when you thought, I want to make acting my life’s work? Very late. Something stirred in me when I saw Lawrence of Arabia and saw what Peter O’Toole did in that. I thought, I’d love to be involved in that sort of thing, but I never in my wildest dreams thought I would be. So, you were born on an island off an island off an island? The village where I was born wasn’t actually an island, but it was always known as the Isle of Geese, within a harbor on the Isle of Wight [off the southern coast of England]. I learned to sail when I was 10. I have a little boat of my own, and I did part of the round-the-world race—from New Zealand to Australia. In Reversal of Fortune, we see your Claus von Bülow character on a boat. Do you ever run into him in London? Sometimes, but I didn’t meet him until about four years after the movie. I knew he wouldn’t tell me anything I didn’t already instinctively know. I couldn’t ask whether he tried to kill his wife. I think I know the answer, and that’s how I played it in the film. He’s funny. We met at a cricket match at Paul Getty’s, who was a mutual friend. Did you know ahead of time that he’d be there? No, I arrived, and Paul said, “Claus is in the house looking around the library. I know you’ve never wanted to meet him, and so I won’t mind if you skedaddle off.” And I said, “Well, I’d quite like to meet him now.” I was sitting watching the cricket, and I heard this voice behind me saying, “You see—I’m not fat!” I turned round and said, “I never said you were fat. I used to do interviews, and I said you were bigger than me. Well, you’re a bigger man than me.” He said, “Do you hear from Alan Dershowitz?” and I said, “No, actually. Since the movie I haven’t heard from him.” And so [von Bülow said], “I understand he’s representing Michael Tyson and Leona Helmsley.” I said, “Yeah, I read about it.” [He replied,] “You haven’t been asked to play either of them, have you?” And I said, “I thought Mike Tyson might be beyond my range, but I’d have a crack at Leona.”. I would think it’d be weird to be face-to-face with someone you’ve portrayed onscreen. I get slightly nervous when I don’t find work that really tests me or when I’m riding horses or I have to change my routine. It gets harder as you get older to learn lines, and sometimes I get nervous I’ll forget them. Not seriously so. A little adrenaline is good, but nerves tend to defeat what you’re trying to do. When did you first set foot in Los Angeles, and what were your initial impressions? I had just made The French Lieutenant’s Woman. I stayed at the Chateau [Marmont] and had a meeting with Natalie Wood and Robert Wagner about some project. It was all very nice. Of course, nothing came of anything. A lot of fat is chewed in L.A. I wasn’t seduced. I was a bit excited about meeting famous people for a while, and there are some nice people there, but I knew I never wanted to live over the shop. Has anyone ever rendered you starstruck? Yeah. I was doing The Real Thing at the Plymouth [on Broadway]. There was a knock, and a voice said, “Mr. Irons.” I looked, and it was Paul Newman. He blew me away. When you won the Best Actor Oscar for Reversal of Fortune, you thanked your Dead Ringers director David Cronenberg and said, “Some of you may understand why.” Tell me what you meant by that. I’d made that film the year before, which got a lot of feedback in Hollywood [with people] saying, “It’s outrageous that you’re not nominated.” I was playing twin gynecologists, and it was quite eye-catching but not Oscar subject matter. But without that movie…This is why I thanked David Cronenberg. Did the twins of the movie really die together, both from barbiturate withdrawal? I don’t know whether it was cold turkey or…The problem is if you’re doing cold turkey and you take more drugs, you’re in trouble. They were found naked in their flat, just wearing socks. When you were walking up to accept your Oscar, you stopped and kissed Madonna, who was sitting front row with Michael Jackson during their famous 1991 Oscar date. I would have stopped to kiss to anybody! No! But at that moment, I nearly kissed Michael Jackson. 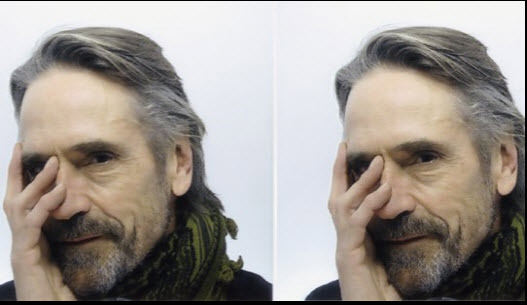 Can you enjoy a Jeremy Irons film the way the rest of us can? It takes me about 20 years. I saw The Mission about 20 years after I made it, and I was able to see it quite dispassionately and see the guy on the screen. I thought, He looks a bit like my son. Who’s that? You’ve had the same people in your inner circle for decades. I like longevity. You get to know people, their ups and their downs, their goods and their bads. I’ve always thought the devil you know is better than the devil you don’t. You’re known for having one of the greatest voices in the world. What is your favorite word to say? But what if the person’s idea is actually horrible? Well, you just don’t do it.